Live recording of Rossini's comic opera, with Enrique Mazzola conducting the London Philharmonic Orchestra at the Glyndebourne opera house. 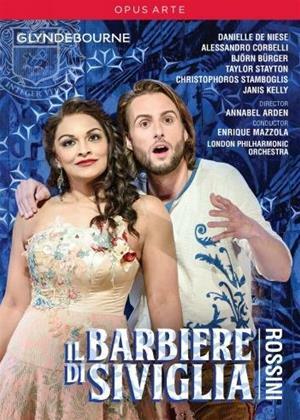 Björn Bürger is the all-knowing barber of Seville, who assists Count Almaviva (Taylor Stayton) in his quest to seek the hand of Rosina (Danielle de Niese), with whom he is utterly besotted. Each time however, complications arise, most notably in the form of Dr Bartolo (Alessandro Corbelli) with whom Rosina lives and who intends to marry her promptly. Both the barber and the Count devise ever more absurd plans to reach Rosina, only to be thwarted each time in increasingly comedic fashion.